Manica was a widespread element of gladiator padded arm protection. It could be made of soft padded or quilted few-layered clothes. Such protection was fixed with leather belt and strings on the arm. Retiarius - on the left arm. This is left hand manica with brown leather fastenings. SOLD You can order this helmet by your measurements here. Helmet combines the most importnant properties, that are required for safety battle: -good visibility -perfect ventilation -wonderful protection Peak amortizes the stricking force in case of strict stroke. Mail aventail provides with complete face and neck protection. Bar grill visor has distance 2.1 cm between the rods, that is completely compliant to SCA standards. For head circumference 58-61 cm. Price includes the following options: -normal steel 2.0 мм -satin polishing -chinstrap -blued mail aventail -padded aventail -sewed liner Was not in usage. Ready to ship. .. 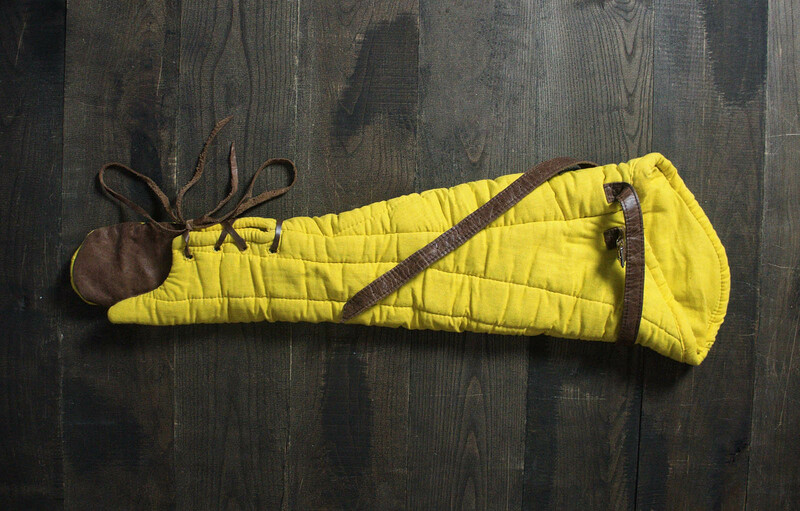 This gambeson is sold out! 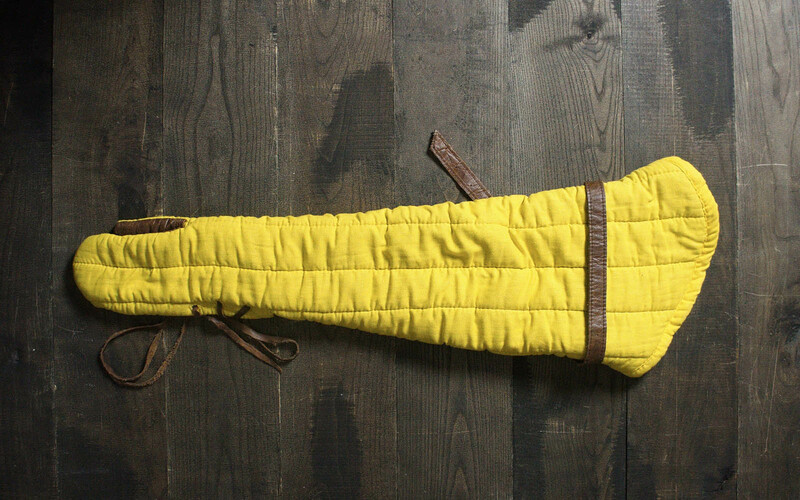 But if you want the same - you can order the custom medieval gambeson here. This simple and popular model of gambeson of XI-XV century is suitable for usage for both, men and women. We use only 100% natural fabrics of different colours for medieval gambeson manufacturing. You can use this gambeson for: SCA HEMA Larp This gambeson has: leather straps with steel nickel-plated buckles fastenings for steel arms in brown leather holes under the armpit Outer side: black linen Inner side: black cotton Layers of padding: 2 layers Length of the gambeson - 88 cm (34,6 inches) Length of the sleeves - 61 cm (24 inches) Length of the shoulder - 16 cm (6,2 inches) Сhest - up to 125 cm (49,2 inches) Waist - up to 120 cm (47,2 inches) Hips - up to 130 cm (51,1 inches) .. This model of gambeson is dated by VI-XIII centuries, thus classified as Early medieval gambeson. 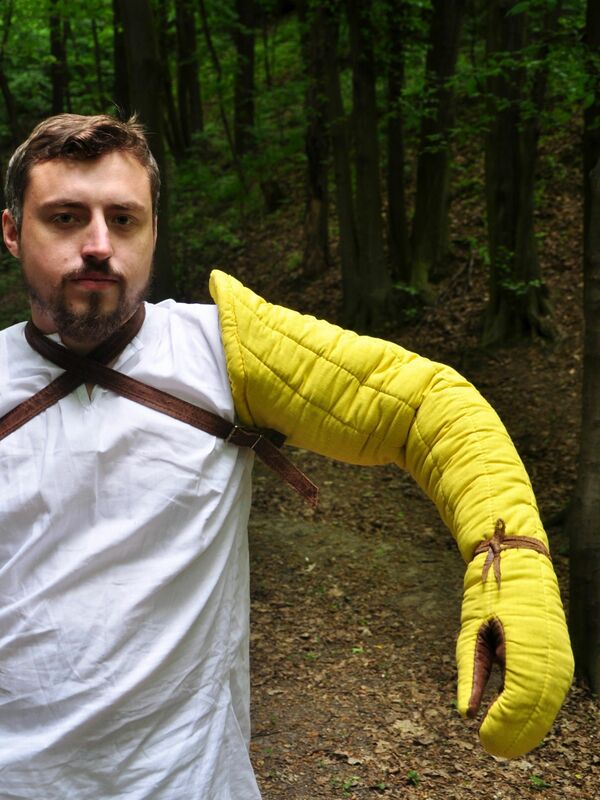 This short sleeved gambeson was not providing complete protection of the arms, this model is peculiar to people who did not take participation in close fights. This viking gambeson has: - sleeves with holes under the armpit - black leather fastenings - 3 layers of padding Outer side: black cottonInner side: black cotton Length of the gambeson - 95 cm (37,4 inches)Length of the sleeves - 36 cm (14,1 inches)Length of the shoulder - 7 cm (2,8 inches) Сhest - up to 75 cm (29,5 inches)Waist - up to 60-65 cm (25,6 inches)Hips - up to 80 cm (31,5 inches) ..
Conical helmet of the XII century.. This medieval shirt is made of natural white linen. It has two buttons on collar and buttons on the sleeves. Shirt fits for parameters: Chest: 100-116 cm Height up to 190 cm Total length: 83.5 cm Sleeve length: 68 cm ..